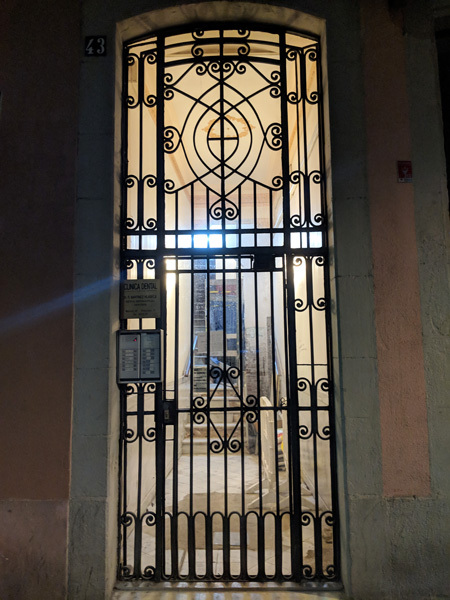 Our front door in Barcelona. They’re installing a lift in the building, which meant the foyer was in quite a state while we were there. ICYMI: Dusty and I missed our first market weekend last week because we were taking our first vacation in five years. With so much pent up vacation need, we decided to go big — and so we went to Barcelona. We stayed at an AirBnb in a little neighborhood near Mercat de Sant Antoni, a recently renovated and bustling market. Well, sort of bustling, or bustling on some days, at some times. We arrived on Monday morning, got ourselves nominally settled into our apartment, and headed straight for the market to check it out. This is what anyone would do, right? Sant Antoni advertises itself as being open from 8am to 8pm, Monday through Saturday. On Monday afternoon, though, it was a little bit like being at the Broad Street Market after 5pm on a Friday evening — there were some stalls open, some things to see, but, really, not much going on. We spent a while, though, at Xarcuteria Pep, helped by a woman who initially seemed disappointed that we did not understand Catalán. I can read and write Castilian a bit. I can speak Castilian a little bit less. I am not, it turns out, great at understanding the rapid-fire Castilian of someone who would prefer to be speaking Catalán. There were times when I understood so little, I thought maybe she just was speaking Catalán. But, as we sampled various cheeses and hams, it seemed like we were able to understand what we needed to verbally, and, truly, everything we needed to through our taste buds! We wound up with two different types of jamón ibérico, a package of a traditional Catalán salamis, and three types of cheese. A loaf of bread from a close stand. A half dozen brown eggs. Everything we needed, and all in Castilian! For what it’s worth, our subsequent visits to Sant Antoni also revealed that despite how it appeared on Monday, it is a bustling market, more so in the mornings, more so towards the end of the week. Kind of like our market! We visited two other markets on our trip, the enormous and tourist-filled Boqueria near Las Ramblas (definitely worth a walk-through, but hard to imagine actually trying to shop at), and the smaller, less touristy Santa Caterina in Born. We were a little late getting to Santa Caterina (and the merchants were a little early in closing) on a weekday afternoon so it’s hard to make a fair comparison, but despite Santa Caterina’s reputation as the best market in Barcelona, Sant Antoni has my heart. Pintxos at Tasqueta de Blai. Monday evening, after a nap, we scoured the internet for somewhere to eat. Monday nights are not totally without options in Barcelona, but the choices are somewhat limited. We wound up walking just a little south from our apartment to Carrer de Blai in the Poble Sec neighborhood, where the pedestrian-only street is lined with little storefronts, many of which house bars covered in hundreds of tiny plates of food. There’s a lot of outdoor seating, so we found a place with an available table, ordered some drinks, and took our plates up to the bar. “Pintxo” basically means “to stab”, and refers to the toothpick that holds together the contents of each plate. 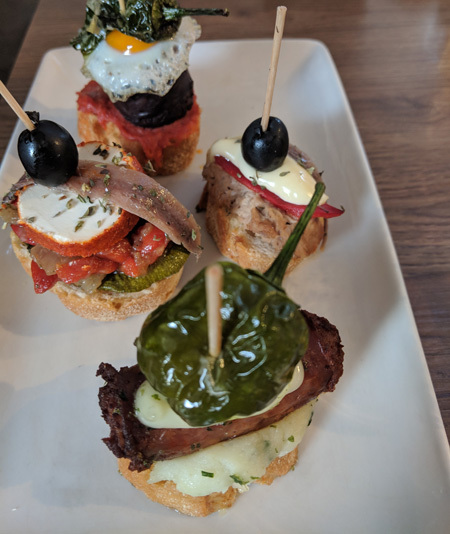 It’s a Basque thing — a slice of bread, topped with any number of things (goat cheese and roasted red pepper; ham and jam; sausage and padrón; etc), stuck through with a toothpick. The color of the toothpick or plate indicates how much it costs — usually a euro for the “basic” type, and €1.50 or so for something fancier. You keep all your toothpicks, and then the server or bartender tallies them up at the end to give you your bill. If you sit at a table, you might pay 10% more; if you sit outside, maybe 20% more (this is true at most restaurants, not just the pintxo bars). We opted to sit outside when possible throughout the trip, happy to pay the premium for the premium people-watching. This, of course, is a Barcelona must-see. The internet is chock-full of far better photos than anything I took with my cell phone, and tons of info, so I’ll let you look it up if you’re so inclined. But here’s my favorite picture — not the stained glass, but the light coming through it at dusk. We designed our trip to be pretty affordable (at least as European vacations go…). Airfare was a bargain. The AirBnb was a bargain and allowed us to cook some of our own meals. We walked everywhere. We tried to keep it reasonable. But we knew that food would still be a major expense, and we decided to make our one big splurge at Ángle, a one star Michelin restaurant from chef Jordi Cruz. There are quite a few Michelin-rated restaurants in Barcelona, and both the country and the region are renowned for their pioneering chefs, largely thanks to brothers Albert and Ferran Adrià who mentored basically an entire generation of such chefs (but not, actually, Cruz). When we decided a crazy fancy meal would be our vacation splurge, we read tons of reviews, scoured restaurant websites, and tried to figure out where we could actually get a table. Happily, we were able to get one at Ángle, our first choice based based on all our research, for a day and time that worked well for us. It did not disappoint. I mean, I’m not planning on figuring out how to work Michelin-starred restaurants into my budget on a regular basis or anything, but olive ice cream, duck paté oreo, real wasabi grated onto my plate right in front of me, and an incredibly delectable roasted pigeon — all of these delighted my palate and stretched my mind. It really was an experience, not just a meal. Maybe the best part of being in a city with so many high-end experimental restaurants, though, is that the ideas and quality generated in these kitchens gets passed down the ladder to many of the more accessible options. There are a lot of good restaurants in Barcelona, ranging from those serving up straight traditional fare, to — where we, honestly, did more eating — those combining traditional fare with modern touches and thoughtful flair. Two other highlights for us were Agust and Arume, the former with French influences, the latter with Galician. Both delicious, interesting, even surprising. And very close to our apartment — Agust really just around the corner, and Arume a short walk away. Further afield was Somorrostro, in Barceloneta, near the beach. They’re doing “Slow Food” — locally sourced, organic, and ethical. Also delicious! Gorgeously garnished cocktails at Arume. Some of the best seafood I’ve ever eaten at Somorrostro. Lemon “pie” disguised as an actual lemon at Agust.